I like to think that my plants live or die because of my care. That is a fairly egotistical view. In fact other forces must exist. Things mysteriously happen in a garden. Take Bill’s wisdom for instance, I asked him once how I would know when I was a gardener? What is the measure or mark that would declare me so? Is it when I plant my first sunflower seed in a Dixie cup? Is it when I dig up a plot of dirt outside? Is it when my first vegetable presents itself? He told me I would know when the garden sends me a gift. He told me that when the garden loves the gardener, it will give the gardener gifts. I graciously accepted that reasoning. A few years later, I had moon flower vine spring up from no where, a clump of daisies also appeared from nowhere and the newly planted Foxglove grew to be 5 foot tall instead of 3′ tall. Bill declared these gifts and congratulated me. I was now officially a gardener. He said that they will also let me know when I am doing a bad job. This year I have a surprise addition in my garden, not so much an example of a garden gift but an example of forgiveness. I must have forgotten a Lily bulb left on the ground in a plastic bag. It was never planted. It lay in its baggie in the dirt for a year under snow and leaves, sadly forgotten. Somehow, it broke out of its bag, sent up a stem and found enough sunlight to bloom. 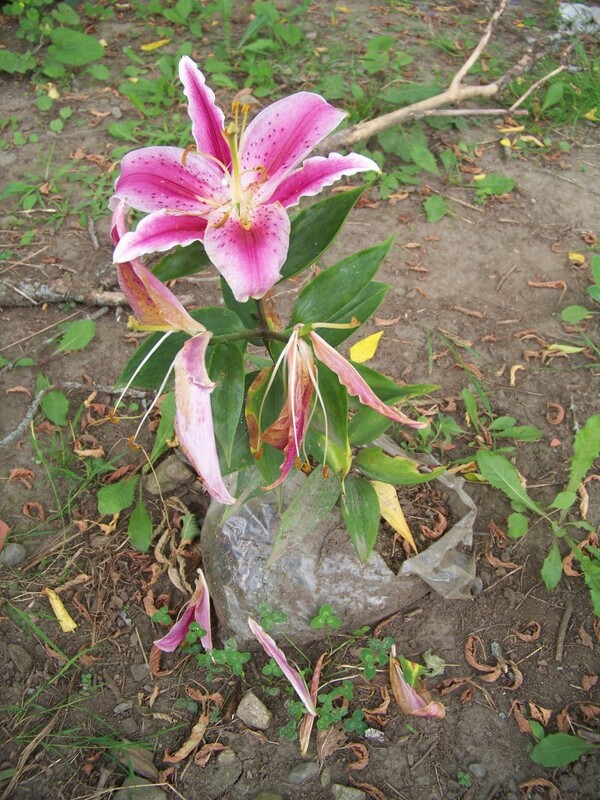 Dispite my lack of effort, the Lily lived and took a place amongst the weeds and sticks that lay near. I’m deciding where its permanent place should be. Thank you, my garden, for withstanding my carelessness and for forgiving me not seeing you hidden here. I’m thinking I shall plant you next to the lavender Phlox. And to my dear readers, may your garden forgive you and send you gifts.